Our next Mystery Knit Along is inspired by the classic story of La Belle et La Bête-- the original story of the beauty and the beast. 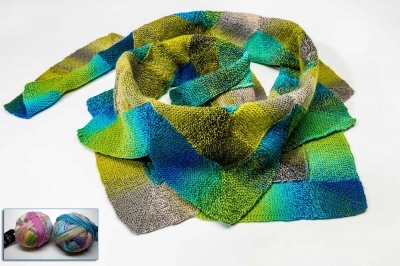 Designed by Janine le Cras, this shawl is worked in lace weight yarn and can be knit in any of the lace weight yarn bases offered by The Unique Sheep, including a new (for this MKAL only) Sea Silk. You choose your colorway -- either one of our exclusive EarthFaire signature colorways or any of those from The Unique Sheep -- and it will be dyed to your specifications. Plus the design looks great with or without beads. All the data can be found on this web page. This article was published on Monday 03 July, 2017.